There is increasing competition for water resources in the face of declining aquifer reserves and increasing risk in many areas of drought related to climate change. At the same time poor water management is damaging agriculture with problems such as salinization, waterlogging, erosion and run-off. This volume summarises the wealth of research on understanding and better management of water resources for agriculture. Part 1 reviews fundamental issues such as plant water use and soil water retention. Part 2 discusses ways of mapping and monitoring groundwater and surface water resources whilst Part 3 covers other sources such as rain and floodwater, waste and brackish water. Part 4 surveys developments in irrigation techniques such as drip irrigation and fertigation. The final sections in the book discuss ways of using water resources more efficiently such as site-specific and deficit irrigation techniques. With its distinguished editor and international team of expert authors, this wlll be a standard reference for agronomists, scientists involved in water and irrigation science as well as government and non-governmental organisations responsible for agriculture and water resource management. 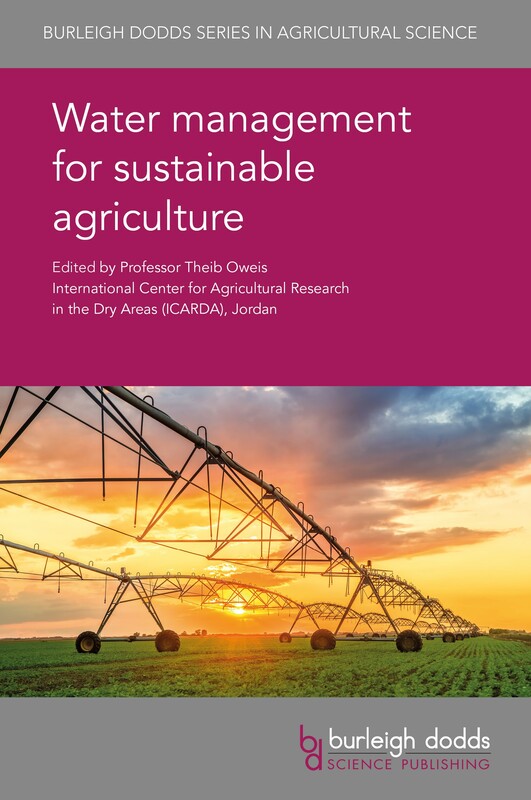 "This book provides excellent source material, covering a range of important topics for sound and sustainable water management practices for agriculture. This is an urgent need as food production is the major consumer of water resources. This book will hold the keys to help unlock the potential for improved water management. The editor and author are to be applauded in taking this issue side by side with issues of sustainability."